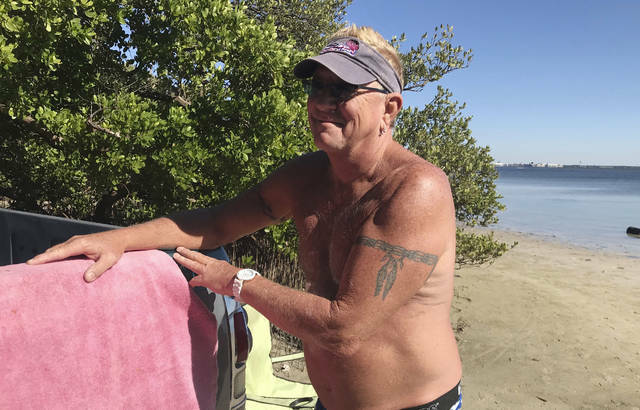 ST. PETERSBURG, Fla. (AP) — Mark Toepfer came to this spit of sand on the Tampa Bay shore to soak up the sun, drink a beer and maybe do a little fishing — not to talk about elections. But talk he did when asked for his thoughts on whether Florida, as a judge recently put it, is “the laughingstock of the world” when it comes to voting. With races for U.S. Senate and governor still undecided, the state’s latest recount only adds to its reputation for bungling elections. To much of the world, vote-counting confusion is as authentically Florida as jam-packed theme parks, alligators on golf courses and the ubiquity of Pitbull (the Miami rapper, not the dog). Florida’s history of election woes dates back to 2000, when it took more than five weeks for the state to declare George W. Bush the victor over Vice President Al Gore by 537 votes, thus giving Bush the presidency. Back then, punch-card ballots were punch lines. 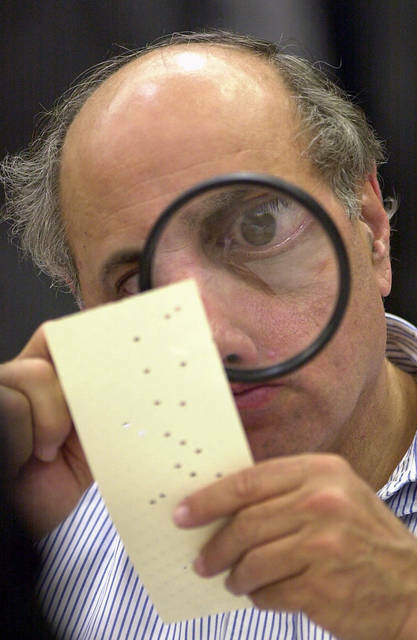 Photos of election workers using magnifying glasses to search for hanging chads and pregnant chads symbolized the painstaking process. There are no chads this year, but there are plenty of cracks about flashbacks to the Bush-Gore contest. And, just as in 2000, the Republican candidates in the contested races have declared themselves winners and asked for the recount to stop. Add to this a litany of other voting problems: Palm Beach County’s machines went on the fritz during the recount due to age and overwork. The electricity went out in Hillsborough County during a machine recount and resulted in an 846-vote deficit. Broward County missed the state deadline to turn in recount results by two minutes. Those glitches led U.S. District Judge Mark Walker to ask why state officials have repeatedly failed to anticipate problems in elections. “We have been the laughingstock of the world, election after election, and we chose not to fix this,” he said. Walker is presiding over one of several election-related lawsuits that have been filed since Nov. 6. On Friday, election workers in all 67 counties began recounting by hand about 93,000 ballots that were not recorded by voting machines. The entire spectacle drew late-night TV jokes. Ally Hoard, Broward county native and writer on “Late Night With Seth Myers,” was merciless in a video clip. But some others, like 74-year-old Dunedin resident Mary Sanders, said the “laughingstock” comment, and all the jokes, are unwarranted. Sanders, a volunteer with the League of Women Voters, spent Thursday in a windowless room at the Pinellas County election supervisor’s office with dozens of other observers, watching officials scrutinize ballots. She said the world doesn’t see the normal side of Florida during times such as this. “Here in Pinellas County at least, it’s been a very well-run election,” she said. 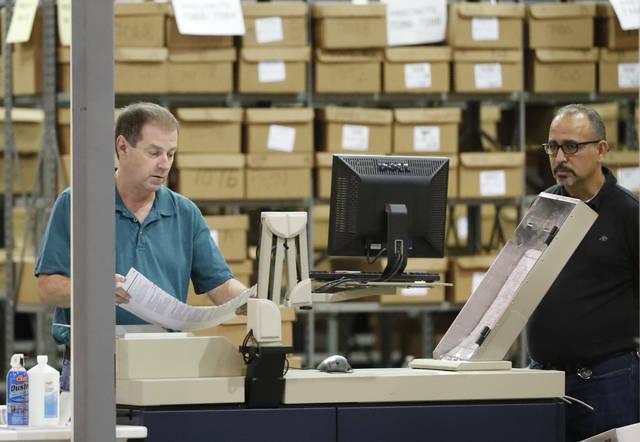 Indeed, the recount there has been run like clockwork, with election officials giving tours of the ballot warehouse and handing reporters detailed agendas of daily activity. Paul George, a Miami historian, isn’t so certain about Florida’s reputation, or as charitable as Sanders. “We’re a joke,” he said. George thinks part of the problem is that, to some degree, people come to Florida to start over. The traditions and habits they had elsewhere aren’t the same in the Sunshine State. And the state has many new citizens, he said, along with confusing ballot designs. Or perhaps, he mused, election drama is something intrinsic to Florida. “Are you aware of what happened in 1876?” he asks, with mirth in his voice. That’s when the U.S. had a hotly contested presidential election. The winner wasn’t certain until March 2, 1877. Democrat Samuel Tilden won the popular vote, and Republican Rutherford B. Hayes won the Electoral College. Allegations of fraud abounded. Votes from three states were disputed. Which state had problems? “MORE TROUBLE IN FLORIDA,” read an Associated Press headline from Jan. 6, 1877. Abrams made no such retreat from her criticisms of Kemp, saying she refused “to say nice things and accept my fate.” Instead, she announced plans to file a federal lawsuit to challenge the way Georgia’s elections are run. She accused Kemp of using the secretary of state’s office to aggressively purge the rolls of inactive voters, enforce an “exact match” policy for checking voters’ identities that left thousands of registrations in limbo, and enact other measures to tile the outcome in his favor. Associated Press writer Russ Bynum also contributed from Atlanta. It’s time for honest consideration of the problems facing Social Security but first, the good news. The Social Security Trust Fund, from which benefits are paid, has a balance of $2.9 trillion. The money that was deducted from our paychecks and the matching contributions from our employers built that balance. Our money is invested in US Treasury Certificates and it will be paid back when it is needed. It is about 13% of our total national debt. Here’s the bad news. We’re going to begin spending down the trust fund in the near future (this year or 2019) to pay benefits. The trust fund was built by large numbers of “baby boomers” who were working and now that they’re retiring Social Security it will be paying out more than current workers are paying in. We’ve known for decades that this time would come but the circular firing squad that we call a congress hasn’t acted. If nothing is done, the Trust Fund will be empty by about 2034 so only current FICA Tax revenue would be available for benefits. That would require a benefit cut of about 21%. All of the solutions proposed so far require some combination of increased FICA tax, delayed retirement or reduced benefits. There will be “winners” and “losers” and only the Congress has the authority to decide who they will be. Increasing the normal retirement age for full benefits doesn’t help as much as you might think. It’s already set to rise to 67. If it’s raised to 70, there will be an increase in valid applications for Social Security disability benefits; and payment of those benefits will offset some of the savings. It’s true that Americans are living longer and drawing benefits for more years than when Social Security was introduced but the proportion who are capable of working declines with every year of age increase. Another possibility is to raise the FICA tax on both employees and employers. It is currently 12.4% (half paid by employer and half by employee) on wages up to $128,700. There is no Social Security tax or increased benefit for those with higher incomes. Raising that tax is a terrible idea because the entire 12.4% comes from money that employers have available for wages and benefits to middle and low income employees. Those wages are not keeping up with the cost of living and a FICA tax increase will make that problem worse. We need a way to preserve Social Security without harming our low and middle income workers and their families. One possibility is a “flat tax” of 1 or 2 percent applying only to income in excess of the $128,700 cap on the FICA tax. The new tax should apply to all income: wages, interest and every kind of investment income. That would be sufficient to fund Social Security far into the future without raising the FICA tax or increasing the normal retirement age; and it would be a tiny step toward fixing laws that unfairly tax wages at higher rates than investment income. It is the hourly workers of our nation who have produced the extreme wealth enjoyed by the top 1%. This is not a plan to penalize the wealthy. It is merely a way to assure a decent and safe retirement for the people who produced their wealth. It’s the same kind of thinking that got us through the early 20th century, the last time when income and wealth shifted from the middle class to the few. I hope someone comes up with a better idea, but this is one that will work. Making the necessary choices is going to be difficult for any congress and any President but the time for action is upon us. Doing nothing is no longer an option. Nor is it an option to allow Social Security to fail. We, the people, were never asked, back in 1787, what sort of government we’d like. Only a scant handful of people from a mere six percent of the populace (white, propertied males) were invited to actively participate in crafting the Constitution. The rest of us have struggled for freedom and power ever since. For we are talking about a revolution. To sustain and avoid the pathological destructive desire for vengeance, the revolution must be nonviolent in nature, but its scope is a massive upheaval, not just in politics, but in society and culture as well. Make no mistake: our culture is far from democratic. Even the overhaul of the injustices that burden the current political apparatus would require revolutionary changes. An effort that seeks not just minor adjustments, but a profound re-envisioning in the ways we make every decision in our lives is nothing short of a revolution. It should be treated and understood as such. We should prepare ourselves for the reality of demanding such change. We must gird ourselves for the struggle if we ever wish to see government of, by, and for the people, all of us, together. Author/Activist Rivera Sun, syndicated by PeaceVoice, is the author of The Dandelion Insurrection and the sequel, The Roots of Resistance, and a nationally known movement trainer in strategic nonviolence. The essays were originally published on Dandelion Salad, and are reposted with permission.